The bow doesn’t always have to be tense. British Prime Minister Theresa May and German Chancellor Angela Merkel proved this yesterday at the special Brexittop in Brussels. The two heads of government both wore blue jackets and black blouses, and the media had noticed that. 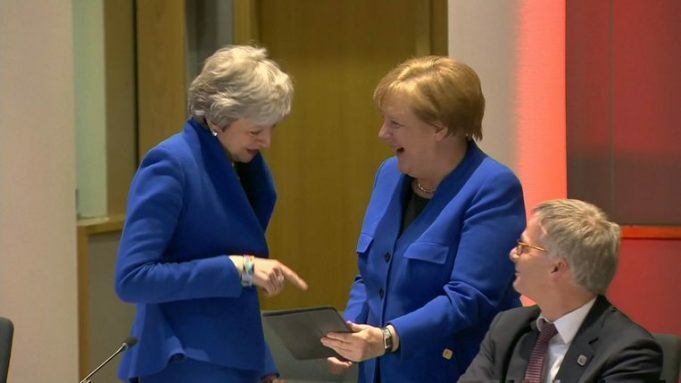 Chancellor Merkel came by with her iPad to Prime Minister May, who immediately started to laugh. ©ENEX Premier – May laughs with a photo that shows Chancellor Merkel on her iPad. Merkel showed a photo in which the women were also spotted in the same outfit.